The Digital Technologies curriculum includes the teaching of binary code to our students. This can be quite daunting for many classroom teachers with limited understanding of binary, but it doesn’t have to be. Binary Code is a way of representing information using the binary digits 0 and 1 to represent a letter, digit, or other character in a computer or other electronic device. There are many resources available to support teachers with implementing lessons to develop students knowledge of binary. A favourite of mine is Binary Bracelets from code.org, an unplugged lesson, meaning there is no technology involved. This fun lesson makes students understanding of binary visible with the creation of a bracelet. Using the code.org Binary Decoder Key, students design their bracelet using their initials. I then have students sketch their binary code on a whiteboard using two chosen colours before creating their bracelet. Students then create their very own bracelet representing their initials. Begin by having students choose two coloured beads to represent 0 and 1. 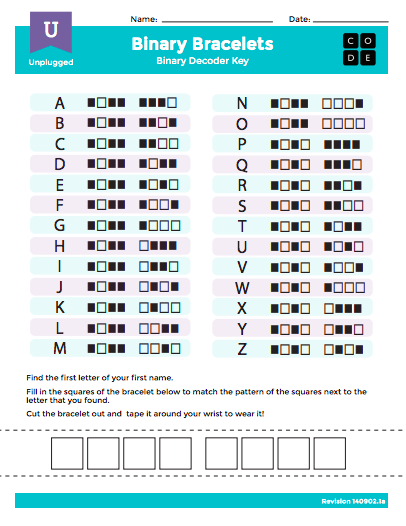 For younger students, I also have them choose one other colour to represent the beginning of their binary code and to separate each letter. Students have now created a bracelet they can wear and be proud of for what it represents. This in turn creates a discussion with other students, teachers, and their family, allowing them to share and explain how binary code works. How are you introducing your students to binary code? I have created my own template for teaching students about Binary code. You can get a copy of this recourse from my TPT page.